Atlas starts Year 10 just as his best friend Elliott moves abroad. Atlas emails Elliott, telling him about everything going on at school and in his life. As well as a way of keeping in contact, the emails are an outlet for Atlas’s creativity. The letters are full of drawings, sketches, Top 3 lists and memes. Despite living on opposite sides of the planet, the boys continue producing their own web comic “ Zoo”, a humourous reflection on school life, set in a zoo. 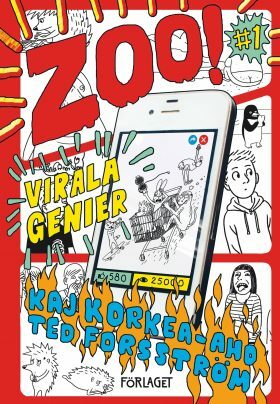 Zoo #1: Viral Geniuses is an outrageous, laugh-out- loud series about the everyday life of a teenage boy, full of surprises and relatable moments. Hard to resist, impossible to put down. Partially illustrated in comic book style by Pertti Otsamo. A hormone-fueled and positively quirky depiction of teenage world. It describes poignantly the hassle and drama of high-school and the fundamental need to be part of the group. Guaranteed to make readers of all ages laugh. A cleverly laid out smorgasbord of various communication styles that is visible in the text and illustrations.